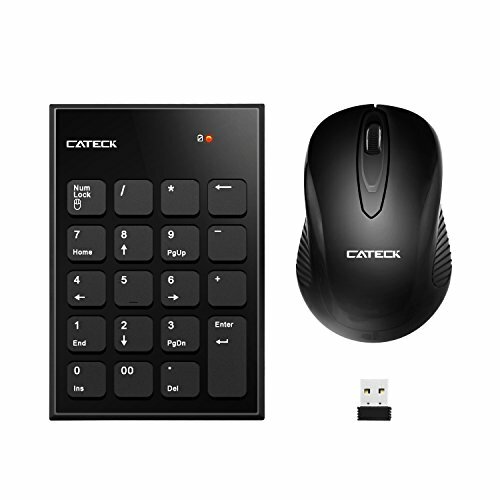 Cateck 2 in 1 2.4G Wireless Mini USB numeric Keypad & mouse combo is the perfect accessory to complete your workspace. Just need to insert the receiver to the device's USB interface. Featuring a full keypad with Number Lock, the Wireless USB Number Pad is a great wireless solution for extending your existing keyboard, Easy Your Life! The Red LED indicator on Top right Corner indicates Whether it's ready for data entry or not, Press Num Lock button to Shift Numbers and Function Inputting. Deep sleeping current: 60uA, It enters standby mode 90s. 1. When the red light flashes, it indicates the battery is low, please kindly replace the battery.